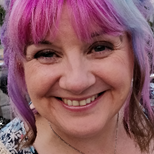 Claire Power is a gifted intuitive who communicates with angels and spirit guides to receive messages through clairvoyance and clairsentience. Claire works with people as a spiritual counsellor and mentor, helping people discover and explore their spirituality. As a qualified soul midwife, Claire also works with people who are in the process of transitioning from this life to the next, assisting them and their families in releasing any issues around the process of dying and death. From June 2020, Claire will be an ordained minister and registered solemniser, able to perform legal wedding ceremonies.